Cece Peters, Annie Maynard, Madeleine West and Olympia Valance star in the TV series Playing For Keeps. BEHIND every king is a king maker who paves the way for success. Ten's new female-led drama Playing For Keeps explores what goes on off the field in the glamorous world of Aussie Rules, following the lives of the wives and girlfriends of high-profile coaches and players. "How wonderful to have a prime-time drama that is about women. 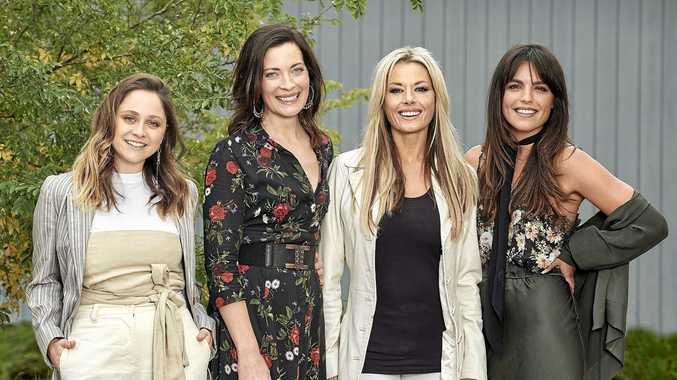 I haven't experienced such an inclusive, female-dominated cast since I did Satisfaction some 11 years ago," Madeleine West says during a visit to the show's Melbourne set. "This completely goes against that notion that women are their own worst enemies and that we're really out to claw each other's eyes out. Girlfriends are all about their girlfriends and this show typifies that. "What's so delicious about this world is they all come from different backgrounds but what they have in common is the love and support and sacrifice they make to support their men who play this great game and the pressures that come with that." 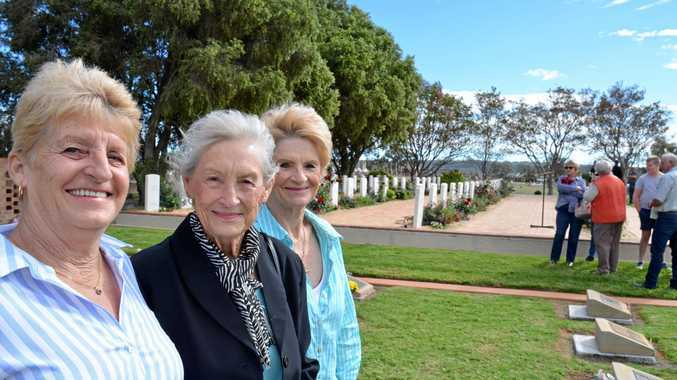 Playing For Keeps centres on four women behind key figures at the Southern Jets Football Club. West plays Kath, the wife of coach Brian Rickards (Jeremy Lindsay Taylor). She's joined by Olympia Valance as Tahlia Woods, an ambitious social climber and girlfriend of club captain Connor Marrello, Cece Peters as Paige, a down-to-earth high school teacher who moves to the city to follow her high school sweetheart, and Annie Maynard as Maddy, a high-flying lawyer and wife to seasoned Jets player Travis Cochrane. "It's so delightful when we first step into this world in episode one because it is how the objective person would view the world of the wags - all glamour, all gloss, money, money, money," West says. "We soon learn there are plenty of perks but there are some deep chasms of disadvantage that come with being under so much scrutiny. "Kath's whole sense of self and her value system has been tied to being the power behind the throne. In this first series she is in the midst of a mid-life crisis. She's questioning who she is and this role she's assigned herself by choice as the coach's wife, inviting these young boys into her home and playing a semi-mother figure to them. "We very rarely see the woman in her 40s who isn't just the go-to for advice. She's sexual and unapologetically intelligent and doesn't have it all together, but she's full of love and tries her best. She doesn't have to be a 20-year-old ingenue to be interesting." Playing For Keeps premieres on Wednesday, September 19 at 8.30pm on Ten.